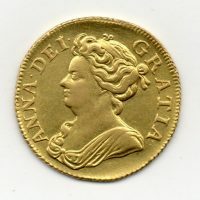 1708 Crown, Anne draped bust, reverse, crowned cruciform shields, SEPTIMO on edge, plumes in angles, good extremely fine with a deep attractive tone. This is a very high grade example and very rare in this grade. 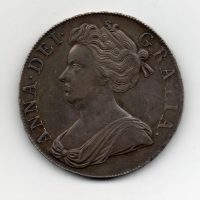 1708 Shilling, Anne, third bust, reverse, Crowned cruciform shields. 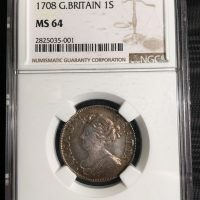 Slabbed by NGC MS 64. 1707 Half Crown, Anne, reverse, crowned cruciform shields, SEPTIMO on edge, S.3604, aef, toned. 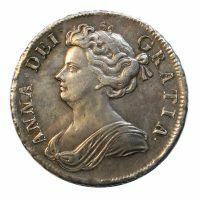 1713 Half Crown, Anne draped bust, reverse, crowned cruciform shields, DVODECIMO on edge, S.3604, good very fine/almost extremely, attractively toned. 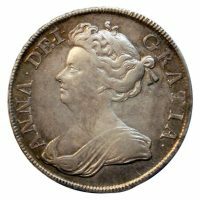 1709 Half Crown, Anne, second draped bust, reverse, crowned shields, OCTAVO on edge, S.3604, almost extremely fine. 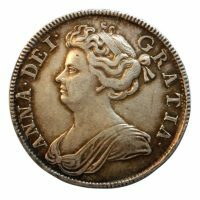 1708 Guinea, Anne draped bust, reverse, crowned cruciform shields, sceptres in angles, nearly extremely fine.